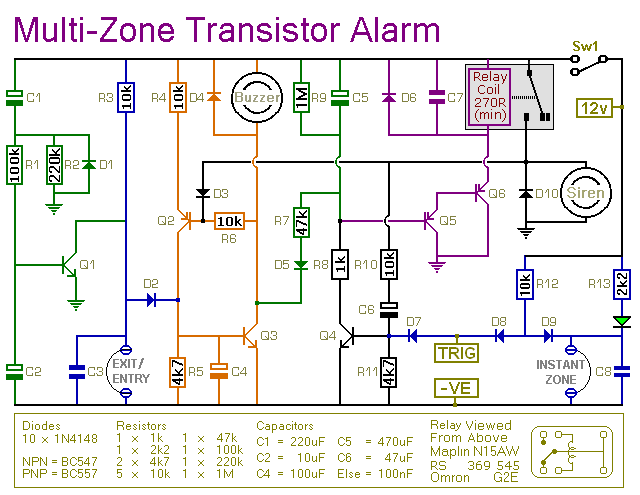 This is a simple transistor based burglar alarm circuit. Its features include automatic Exit and Entry delays - together with a timed Bell cut-off and Reset. It's designed to be used with the usual types of normally-closed input devices such as - magnetic-reed contacts - micro switches - foil tape - and PIRs. The basic alarm has an "Exit/Entry" zone and an "Instant" zone. This will be adequate in many situations. However - larger buildings are best divided into a number of smaller zones. 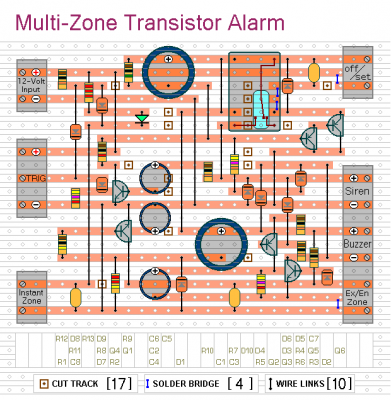 The alarm's modular design means that you can Add As Many Zones As You Like to the system. They are "Instant Zones" - and may be triggered by both normally-open and normally-closed input devices. It's easy to use. Make sure that the green LED is lighting - then switch the alarm on using Sw1. You have about 30 seconds to leave the building. When you return and open the door - the Buzzer will sound. You have about 30 seconds to switch off the alarm. If you fail to do so - the Siren will sound. While at least one of the trigger switches remains open - the Siren will continue to sound. However - if the trigger circuits have been restored - the alarm will reset itself after about 10 minutes. Of course - you can turn the Siren off at any time by switching off the alarm. Because of manufacturing tolerances - the precise length of any delay depends on the characteristics of the actual components you've used in your circuit. But - to some degree - by altering the values of R2, R7 & R9 you can adjust the Exit, Entry and Reset times to suit your requirements. Increasing the values increases the time - and vice-versa. 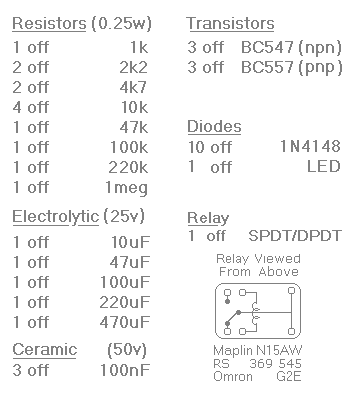 If you don't want the "Instant" zone - leave out D7, D8, D9, R12, R13, C8 and the Green LED.